I’ll never tire of telling this story. Donal Trump was giving out when he was first elected that while lots of Americans liked to buy German cars, Germans were less inclined to buy American cars. He was coming at it from the point of view that the balance of trade between Germany and America was imbalanced. Germany’s deputy chancellor and minister for the economy, Sigmar Gabriel, was asked if there was anything America could do to improve that situation. His response: “Build better cars”. This has been the response, I’ve believed, of Kia since it arrived into the Irish market. You can’t sell more cars by appealing to politicians to change trade rules. You just have to build better cars. That’s why Americans buy more German cars than Germans buy American cars. And it’s also why a reasonably new brand to the Irish market, has managed to position itself nicely in the market. Certainly, the famous seven year warranty has helped a lot. It gives tremendous comfort to a motorist who, after they’ve gotten used to the good looks and the gadgets, ultimately want a reliable car that doesn’t keep them awake at night, or leave them on the side of the road. But building very good cars hasn’t hurt the cause either — and Kia has always done that. The Kia Ceed is now in its third generation, and is now firmly established as a very capable and good value mid sized hatch back in the same C category as the Ford Focus and VW Golf — which probably explains why 1.4 million of them have been built at the Korean manufacturer’s Slovakian manufacturing base. It also comes as an estate which has proven to be a very popular model. I drove one myself a couple of years ago and loved it.It had oodles of space and a sort of comfortable happy car to drive, if that makes sense. The first thing I noticed when I got into the latest edition last Wednesday morning in Dunleas of Kilcullen was that both the comfort and high quality of the interiors, the seats and fabrics. There was nice stitching and soft surfaces. The seats were very supportive and comfortable — that really stood out. These things are important in 21st century commuter belt land. We spend so much of our time in our cars, we might as well be comfortable. 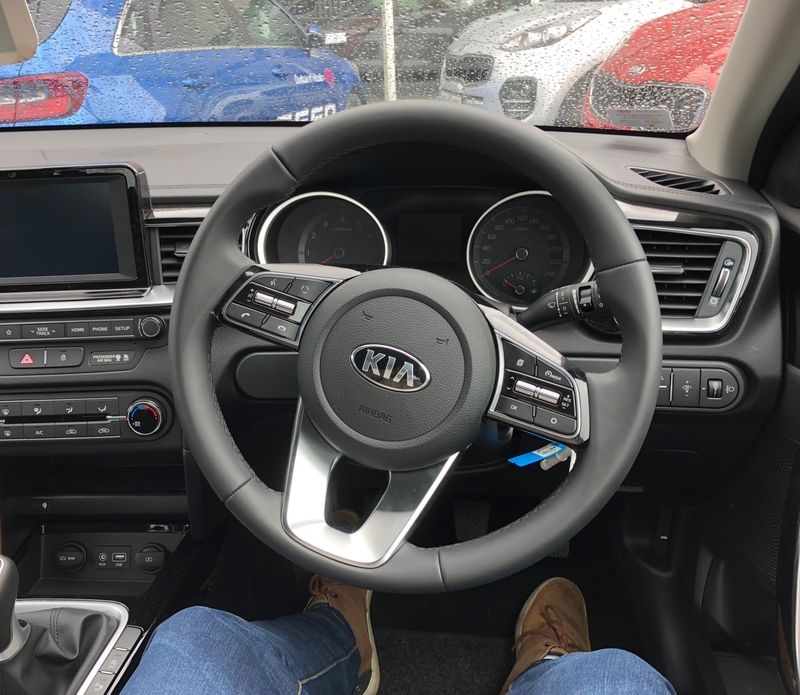 Next thing I noticed was that the steering wheel, while covered in the usual array of controls was far more intuitive to understand and use than many other cars. The central console had a couple of different functions, again, all easy to understand and use. There was an appreciable lack of fuss involved. Driving was also nice. I’d use the word ‘engaging’. Being new the suspension had a nice mixture of firmness and comfort. Most of us want to think that we’re competent drivers, able to cruise around bends at a reasonable clip, but none of us actually wants to go around in a rock hard suspension racing car. (I’ve done that, it’s not something you’d like to do all day). That said, the steering was a tiny bit racy, and that’s a nice thing. These days it is impossible to buy a car without power steering, with the result that the feel of the steering can be a little bit woolly. This felt more direct, with a little bit of feedback, which was nice. And sure enough, the promotional literature around the new release revealed that they added 17% greater feel to the steering. The back seat of the Ceed will be a hit with your rear seat passengers, especially those of a tall variety. It’s extremely generous, certainly the best of any car I’ve seen in that class. The boot is standard for the class — and of course you can put the back seats down for bigger items. I drove two versions: the 1.6 diesel and a 1 litre petrol. Unsurprisingly, the diesel was the more powerful, but the petrol is more than capable. The petrol will certainly be attractive to the price conscious coming in at €23,395, approximatley €4,000 less than the diesel. The range is laid out as K2 up to K5, with increasing levels of spec as you go up, including a powerfully tuned K4 with head turning 140bhp. Dunleas tell me that the hatchback version will shortly be followed by an estate, shooting braking (a sporty estate version) and a SUV over the next few months. Prices range from €22,695 up to €28, 495. For more, contact Dunleas on dunleasofkilcullen.com or on 045-481299.